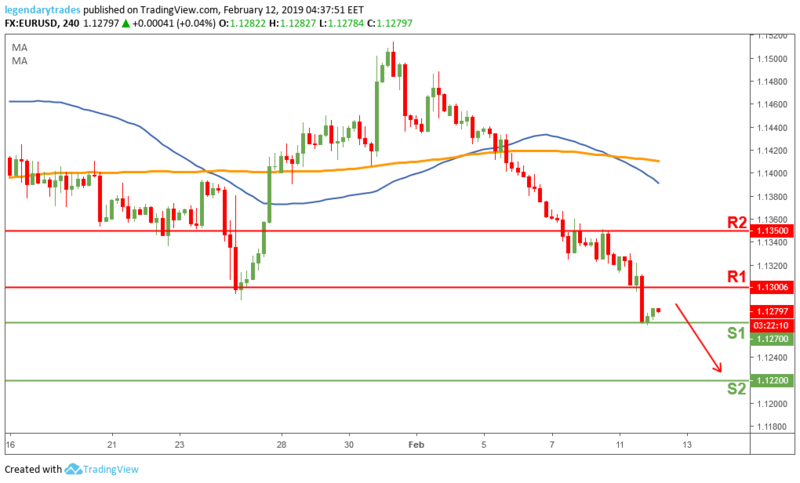 The EUR/USD accelerated the decline yesterday once the bulls lost the 1.1300 level as investors continued to rush to the US Dollar amid the ongoing trade uncertainties. Meanwhile, the head of the Eurogroup said that the slowdown was mainly caused by political risks while adding that the Euro zone fundamentals were stronger than before the crisis. Nevertheless, the single currency ignored these comments and the dollar's bullish momentum continued to be the main driver of the pair’s price action. Today’s main event in the economic calendar is FED’s Chair Powell speech, as it will give investors an idea of whether the FED will stop increasing rates or not. The EUR/USD accelerated the decline yesterday once the bulls lost the 1.1300 level. The price dropped to key technical support level at 1.1270 (S1) and then held just above it. The bears are in complete control so far this month, and they are looking to break below 1.1270 and take price towards the next support at 1.1220 (S2). The bulls need to get back above 1.13 to stop or at least pause this strong bearish momentum.